After premiering at the 2013 Toronto International Film Festival last year, Alexandre Aja's adaptation of Joe Hill's Horns is on the way, with a release planned for sometime later this year. The film is poised to hit theaters on Halloween in the United Kingdom, and Empire has just debuted a teaser poster with Daniel Radcliffe looking rather menacing, and not far removed from the teaser poster that features Sirius Black for Harry Potter and the Prisoner of Azkaban. Plus, there are two new photos from the film as well, one showing Radcliffe with his horns, and another with his girlfriend (Juno Temple) before she ends up dead. Alexandre Aja (Piranha 3D) directs Horns with a script from Keith Bunin ("In Treatment") based on Joe Hill's novel of the same name. 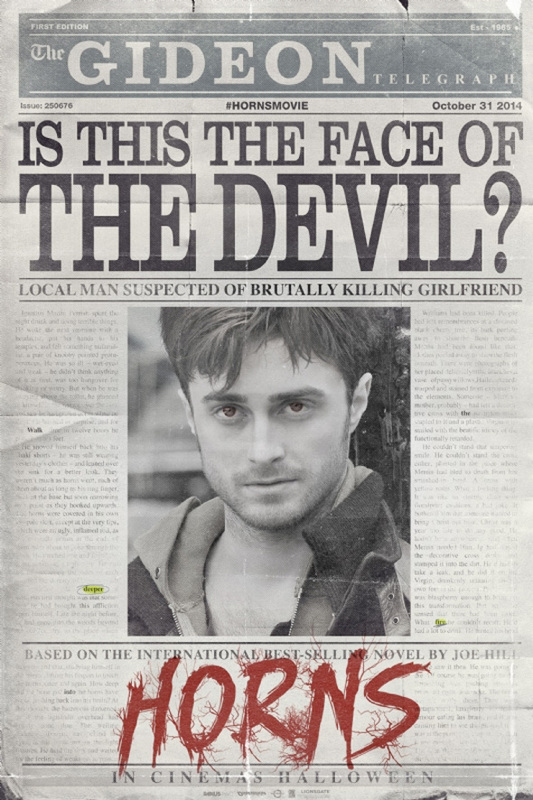 The story follows a 26-year-old man (Daniel Radcliffe) who wakes up after a nasty hangover to find his girlfriend (Juno Temple) has been raped and murdered and he's the lead suspect. Then he discovers horns growing out of his head that grant him the power to make people confess their sins, which comes in handy as he searches for his girlfriend's killer and prepares for revenge. Kelli Garner, Max Minghella and more also star in the film Dimension & Radius-TWC release sometime in 2014. Interested? So this is basically a supernatural version of Brick, right?